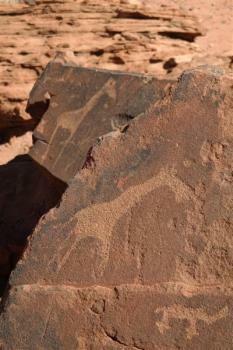 Twyfelfontein or /Ui-//aes contains 2,000 figures of rock carvings. The figures were created over a couple of thousand years before 1000 AD. The hunter-gatherers who lived in the region created them as part of their rituals. The carvings represent rhinoceroses, elephants, ostrichs and giraffes as well as depictions of human and animal footprints. Some of the figures notably the "Lion Man" depict the transformation of humans into animals. Twyfelfontein or /Ui-//aes is a rock engraving site in northern Namibia, supposedly the best of its kind in variation and number in Africa below the Equator. My non-Dutch trip mates had already great difficulty in pronouncing ‘Twyfelfontein’ (which is a perfectly normal word in Afrikaans and Dutch, meaning ‘doubtful fountain’). But try its alternative name ‘/Ui-//aes’: the slashes represent two different clicks in the local Damara language. The site lies deep into a barren valley, surrounded by pretty rock formations made out of sandstone. All of a sudden you’ll end up at a car park and a visitor center – Twyfelfontein caters to 40,000 visitors a year so things are organized quite well. It conveniently lies on the route between Etosha and Swakopmund, and as there is not a lot else to see in the area many tour operators schedule stops here. We are assigned a guide and after a short walk on the main road in the burning heat, we start our tour at the remains of the house of David Levin. He was a white farmer who settled in the area in 1946 to start a sheep farm. He was the one who named the site ‘Twyfelfontein’, and up against the rocks this unreliable but still delivering water source can be seen under a shelter. 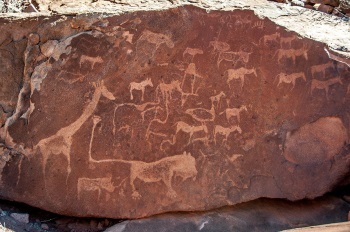 He showed the rock art to an archaeologist, and in 1952 Twyfelfontein already was protected as a monument. The area is covered by two guided circular walks, the Lion Man route and the Dancing Kudu route. The guides seem to randomly do one of those with the group, and ours was the Lion Man route. The routes are equally long (both take about an hour) but do not intersect. The first panel of rock engravings that we are lead to see shows a number of common animals in this region (giraffe, oryx) and their corresponding footprints. A boulder a little further away shows circles: it is assumed that this was a kind of map, indicating the location of the more or less permanent water sources in the area. A second panel depicts the usual animals, plus what appear to be a penguin and a seal. On most rocks, human footprints are depicted next to the animals. These could be the 'signatures' of the makers of the rock carvings. Elsewhere in the world, you often see human handprints in the prehistoric petroglyphs. It then requires some climbing over the rocks to reach the highlight of this route: the image of the Lion Man. It has the body of a lion and human feet with 5 toes. It is assumed that this drawing had a more ritual significance. In all, the visit was a bit too short and superficial for me. I read in a guidebook that the guides aren’t really motivated, and I wouldn’t say that was the case but they just cater to a very generic bunch of tourists passing every day with little or no interest in rock art. To enjoy the area a bit more, I can recommend staying overnight at the pretty spectacular Twyfelfontein Country Lodge. This lies at the other side of the rock and in the buffer zone of the WHS. Its construction made ICOMOS cringe in its evaluation (“severely compromised the integrity of the rock engravings in this area“). It has some rock art as well on its premises. Twyfelfontein ("uncertain spring") got its name mid 20th century from a farmer who was in doubt whether his spring would provide sufficient water for farming. It is famous for a large number of ancient (4.000-500 years BC) rock carvings depicting various types of (mostly) animals - even sea creatures. Contrary to the nearby Brandberg TWHS, it concerns rock carvings and not rock paintings. One can clearly distinguish the different animals in a fantastic setting of orange rocks. To get there, you will need to drive 25km of Namibian 'D-road' (smaller gravel roads). When we visited the site, this road was quite bad but certainly doable, even without a 4x4. The carvings can only visited by guided tour but given the limited amount of tourists, we had a guide for ourselves. The route contains some uneven terrain / very mild climbing but should not be a problem for a normally fit person. However, it can get hot so make sure to bring a hat & water. On my first ever visit to Twyfelfontein i was amazed with all the various rock formation and the arid desert surviving mopane trees. I thought for a time this is one of the best scene perfect for movie making. Have you ever imagine how the ancesters would dwell round in those boulders, man busy with rock art women with beads and children enjoying the perfect hot spring. Taking your imagination futher what about the Jurassic age how green would have been there. I was astonist to get all abovemention ideas running through my mind. When i realize that the art left behind is for us to interprete and enjoy.Well there is all kinds of interpretation to the art as the academic ,scholars ,locas, visitors who so ever can just came and express what they see and leave every thing as it is for the next generations to enjoy. Well for the youth as the future leaders let us try to penetrate the science of archaelogy. Twyfelfontein is not just a mega of rock arts(Engraving) its a holyritualg round of the hunter gathers who lived during that time.The side was use for various reason as a initiation place,ritual cermonies would take place there as the area is encave and the anscetral spirits would be kept in the enclosure for trance rituals take be more successfull compare to the surrounding.The side manifest the realm of african wisdom and way of cultural recording this shows us the different way of communication our anscester had.Young boys will be teach the diffent kinds of animals found in the area,their foodprint and it will be added with oral history about the hunding and gathering methods of the specific community.For me there is no clear tourism policy to controll tourism in the area and this may in the future have negative impacct on the rock art and the lanscape. Twyfelfontain is an impressive collection of rock carvings found on a hill in central Namibia. It was extremely hot on the day I visited and the climb in the beating sun (there is very little shade and it's steep) was tough. I would therefore recommend water, suncream, sunhat and visiting as early or late in the day as possible. The carvings are incredible. Unlike some ancient rock paintings, it's very easy to distinguish which animals are which. Lots of iconic creatures feature, including an elephant, giraffes, ostrichs, a lion and gemsbok. Some of these are no longer found in the immediate area around the hills, and there is also an image of a seal which indicates the people had access to the coast, a long way off. The site is not very developed and was fairly quiet when we visited. There were no signs of degradation or abuse and we were guided at all times by a well informed guide. Given its out of the way location I assume visitor numbers are probably still low compared to many World Heritage Sites. I found it worthwhile visiting, although I wouldn't go to Namibia solely to see this. Combined with the Skeleton Coast, desert, or a safari though it is worth a look.